Attorney Joel Green raises questions about a proposed medical office building on Black Rock Turnpike durig a Town Plan and Zoning Commission public hearing Tuesday. 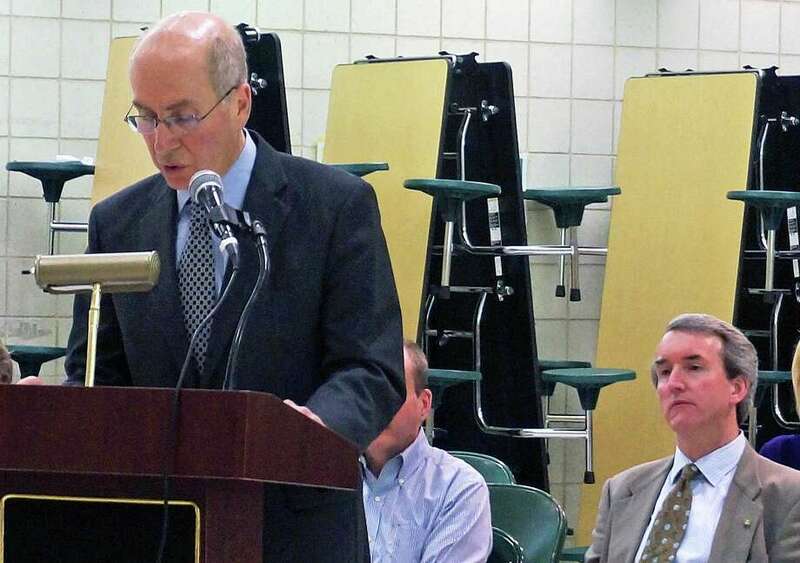 An application for a 25,000-square-foot medical office building on the blighted Plant Factory site on upper Black Rock Turnpike should be denied because it is flawed, a lawyer representing neighbors told the Town Plan and Zoning Commission at a Tuesday public hearing. The lawyer, Joel Green, represents the Greenfield Hill Improvement Society and the Merritt Parkway Conservancy in their opposition to the building application from New Way Associates, LLC. The TPZ made no decision on the application, which seeks a zone change from Residential to Designed Commercial for a 2.28-acre slice of the property that fronts on Black Rock Turnpike. The rest of the property would remain zoned for residential use. New Way's lawyer, Chris Smith, said his client does not need to apply to subdivide the property because under regulations, it is allowed a "first free cut" of the land. But Green said a map showing that subdivision has to be recorded in the town records, and it has not been. "The division has not occurred, as I understand it," Green said. "There's no deed that's been recorded"
Smith said if the application is approved, the property will be divided and the map filed with the town. Green also contended that a wetlands permit issued for a previous plan to build a medical building on the site, which ultimately was denied, has not been transferred to the current application. The other application, which called for two buildings, was rejected in 2011 by the TPZ. Green said that application was submitted by Fairfield Gateway, LLC, not New Way. Smith said the wetlands permit still applies to the property, and also noted that the Fairfield Gateway and New Way development groups comprise the same people. "It's a non-issue, it's a red herring," he said. Another flaw, Green said, is that only property owners within 500 feet of the portion of the land that would be commercially developed were notified by the applicant. According to Smith, notice was properly sent to those who are within 500 feet of the "subject property," or in other words, the portion being developed. Jill Smith, executive director of the Merritt Parkway Conservancy urged the commission to deny the application. The property sits next to the parkway's Exit 44 interchange. "The Nantucket design is not compatible with the residential neighborhood," Jill Smith said, and any landscaping planted around the property would never be tall enough to screen the building from motorists on the parkway. Olive Stokes, a member of the conservancy's board, described the proposed building as a "blue whale" and the application for a "zoning downgrade has the potential of seriously altering the landscape view from the parkway." Chris Smith contended the structure would not be seen from the parkway and that the application uses a landscaping plan developed with the help of the conservancy. Bronson Road resident Stephanie Thompson said the zone change would be detrimental for the neighborhood and sets a precedent for the whole town. "Black Rock Turnpike is already very busy," she said, and this building would have a negative impact. In rebuttal, Chris Smith said zone changes are up to the TPZ and the medical building application would not, as opponents claim, set any precedent for other properties. He also pointed out that there were no immediate neighbors objecting to the proposal because there really aren't any adjacent neighbors -- the closest residence, he added, is 470 feet away.